The film The Incredibles hit the theatres in 2004, but it’s only now that a sequel was released for this fun animated film. All of a sudden, things seem to move fast, as now, LEGO also released a game based on both the first and the second film. A lot of story content to plow through, that’s for sure, but you can be sure you’ll be treated to the same old LEGO treatment, should you decide to buy this title. The story of the game combines the story of the first Incredibles film with the story of the second one. It’s a bit strange to see that the game starts off with the storyline of the second film, while only later going back in time to play the story of the first film. Nonetheless, it wasn’t really bothersome, so we just went with it. This means that first of all, the Parr family has to fight the Underminer. Superhero’s aren’t that popular anymore though, and they have a hard time getting through. When they meet Winston and Evelyn Deavor from DevTech, this might change for the better though. Later, Mr. Incredible thinks back to when it all began, and thus we end up in the first movie. Here you’ll have to fight off Syndrome, who has a personal grudge against Mr. Incredible after he let him down fifteen years ago. He’s got an omnidroid, a very powerful and smart robot, which will destroy the city, after which Syndrome can save the city from this monster and get the recognition he longs for. It’s clear that there’s a lot of story content, but luckily, it’s all kept quite summarized, so you’ll not lose too much time, but will mostly be able to just play. We found it quite nice to have such an elaborate story though, as it just felt more worthwhile. 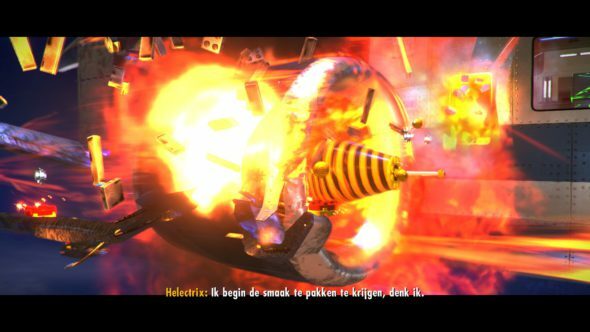 Many LEGO games have already passed the revue and, truth be told, there isn’t that much difference between them when it comes to graphics. Of course other characters take the lead, and the backdrops are completely new, but it’s all still very reminiscent of each other, as it’s all built with LEGO bricks. Thus, it’s mostly a case of preference whether you like it or not, but we’re certainly a fan of the look of the LEGO games. When it comes to sound, LEGO games are always well treated. This time too, as all conversations are voiced (and there are quite a lot of them). The voice cast did a really great job in making the game that much more fun. As usual with LEGO, there’s quite a lot of room for humor, making it all the more fun to hear the characters make funny jokes. The background music is quite energetic when you’re doing a mission, but when you’re just exploring the city, it’s mostly the sounds of the city you’ll hear, such as pedestrians talking or motorcycles passing by, rather than music playing in the background. Both formulas work perfectly fine for their respective part of the game. 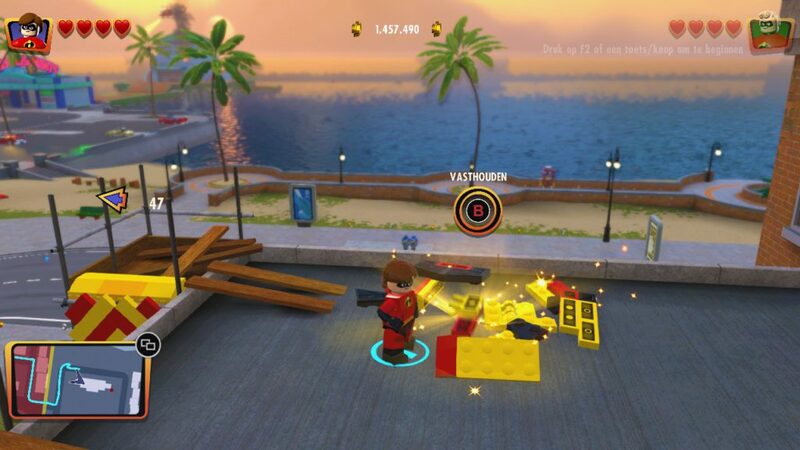 LEGO The Incredibles is an action adventure game in which you’ll have to make sure to defeat you’re enemies in the story mode, but you’ll also be able to save the city from bad guys in the open world. In the missions, you’ll constantly have to think fast, as in order to progress with the story, you’ll have to find solutions to every problem at hand (and you’ll encounter many). You’ll have to be creative with the different abilities of your characters, which is quite fun, as the developers incorporated many possibilities. 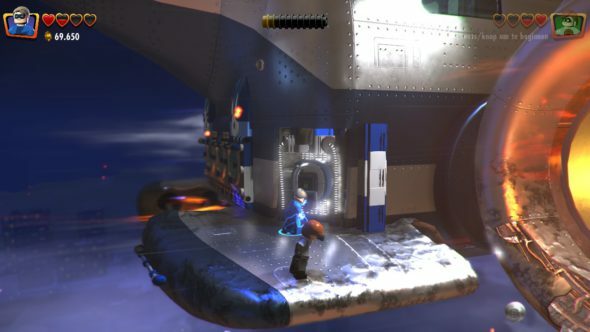 In the beginning, this might be quite hard, but overall, it follows the same structure as other LEGO games, so if you’re familiar with these, you’ll very quickly get the hang of it. During missions, your main focus will of course be to get on with the story and defeat the bad guys, but there are small puzzles incorporated as well. You’ll get rewarded afterwards with extra vehicles or characters, but you won’t be able to complete all puzzles in your first playthrough. This way, the developers created quite good replay value, as completionists will definitely have enough to go back for a second time. If you’re tired of following the story mode, in between missions you can always op to just wander around the city. There, you’ll find many smaller tasks as well, if you’re up for it of course. You can always choose to just wander around too. Some of these smaller tasks include battling thugs or doing speed races. The city is not that big, but it’s certainly a nice change of pace from the story mode. The controls are quite straightforward in this game, so you’ll very quickly get the hang of it. One thing that did annoy us though, is that, when you’re playing with more than two characters at once, and you have to switch between characters, often keeps switching between two of the characters, while it’s the third one you need. Quite frustrating at times, but not unmanageable. LEGO The Incredibles again does what LEGO does good: lots of story content, missions varied with an open world, a well-known franchise, and all of it in the typical LEGO style. Even the gameplay is very reminiscent of gameplay in other LEGO games, so all we can actually say is this: if you love LEGO, keep going and enjoy this one. If you’re not such a big fan of LEGO, you might get the feeling that you’ve seen it all before, so in that case, it might be wise to look a bit further.